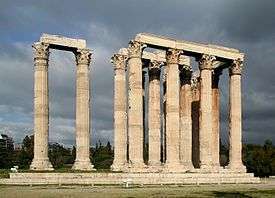 Ancient Greek architecture is best known from its temples, many of which are found throughout the region, mostly as ruins but many substantially intact. 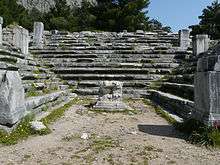 The second important type of building that survives all over the Hellenic world is the open-air theatre, with the earliest dating from around 525-480 BC. 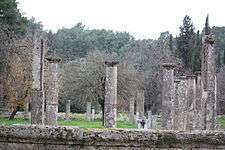 Other architectural forms that are still in evidence are the processional gateway (propylon), the public square (agora) surrounded by storied colonnade (stoa), the town council building (bouleuterion), the public monument, the monumental tomb (mausoleum) and the stadium. 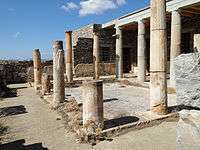 Historians divide ancient Greek civilization into two eras, the Hellenic period (from around 900 BC to the death of Alexander the Great in 323 BC), and the Hellenistic period (323 BC to 30 AD). 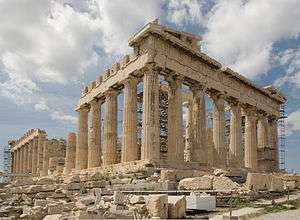 During the earlier Hellenic period, substantial works of architecture began to appear around 600 BC. 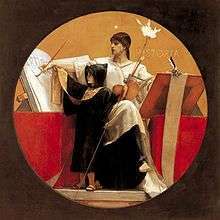 During the later (Hellenistic) period, Greek culture spread widely, initially as a result of Alexander's conquest of other lands, and later as a result of the rise of the Roman Empire, which adopted much of Greek culture. 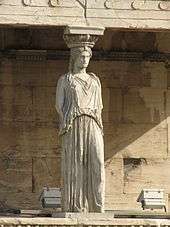 The art history of the Hellenic era is generally subdivided into four periods: the Protogeometric (1100–900 BC), the Geometric (900–700 BC), the Archaic (700 – 500 BC) and the Classical (500 – 323 BC) with sculpture being further divided into Severe Classical, High Classical and Late Classical. 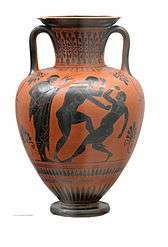 The first signs of the particular artistic character that defines ancient Greek architecture are to be seen in the pottery of the Dorian Greeks from the 10th century BC. Already at this period it is created with a sense of proportion, symmetry and balance not apparent in similar pottery from Crete and Mycenae. The decoration is precisely geometric, and ordered neatly into zones on defined areas of each vessel. These qualities were to manifest themselves not only through a millennium of Greek pottery making, but also in the architecture that was to emerge in the 6th century. The major development that occurred was in the growing use of the human figure as the major decorative motif, and the increasing surety with which humanity, its mythology, activities and passions were depicted. 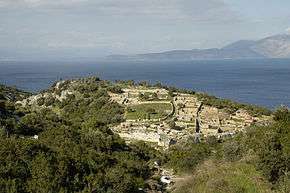 The Doric Order developed on mainland Greece and spread to Magna Graecia (Italy). 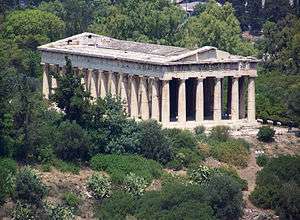 It was firmly established and well-defined in its characteristics by the time of the building of the Temple of Hera at Olympia, c. 600 BC. The Ionic order co-existed with the Doric, being favoured by the Greek cites of Ionia, in Asia Minor and the Aegean Islands. 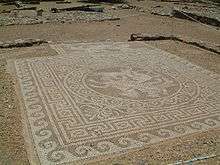 It did not reach a clearly defined form until the mid 5th century BC. 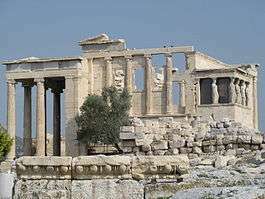 The early Ionic temples of Asia Minor were particularly ambitious in scale, such as the Temple of Artemis at Ephesus. 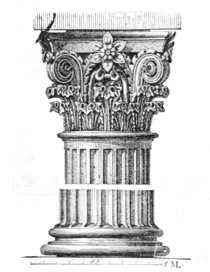 The Corinthian Order was a highly decorative variant not developed until the Hellenistic period and retaining many characteristics of the Ionic. It was popularised by the Romans. 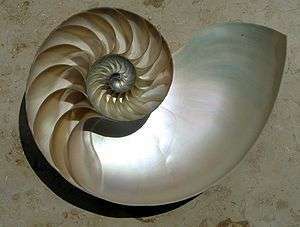 The Ionic Order is recognised by its voluted capital, in which a curved echinus of similar shape to that of the Doric Order, but decorated with stylised ornament, is surmounted by a horizontal band that scrolls under to either side, forming spirals or volutes similar to those of the nautilus shell or ram's horn. In plan, the capital is rectangular. It is designed to be viewed frontally but the capitals at the corners of buildings are modified with an additional scroll so as to appear regular on two adjoining faces. 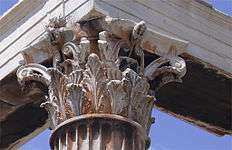 In the Hellenistic period, four-fronted Ionic capitals became common. 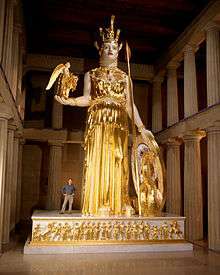 The Severe Classical style (500 – 450 BC) is represented by the pedimental sculptures of the Temple of Zeus at Olympia, (470 – 456 BC). The eastern pediment shows a moment of stillness and "impending drama" before the beginning of a chariot race, the figures of Zeus and the competitors being severe and idealised representations of the human form. The western pediment has Apollo as the central figure, "majestic" and "remote", presiding over a battle of Lapiths and Centaurs, in strong contrast to that of the eastern pediment for its depiction of violent action, and described by D. E. Strong as the "most powerful piece of illustration" for a hundred years. 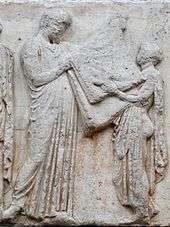 The shallow reliefs and three-dimensional sculpture which adorned the frieze and pediments, respectively, of the Parthenon, are the lifelike products of the High Classical style (450 – 400 BC) and were created under the direction of the sculptor Phidias. 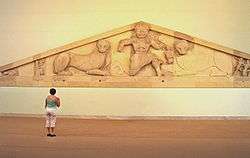 The pedimental sculpture represents the Gods of Olympus, while the frieze shows the Panathenaic procession and ceremonial events that took place every four years to honour the titular Goddess of Athens. The frieze and remaining figures of the eastern pediment show a profound understanding of the human body, and how it varies depending upon its position and the stresses that action and emotion place upon it. Benjamin Robert Haydon described the reclining figure of Dionysus as "....the most heroic style of art, combined with all the essential detail of actual life". 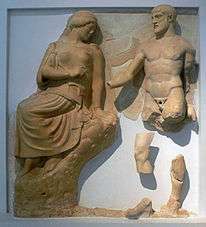 The names of many famous sculptors are known from the Late Classical period (400 – 323 BC), including Timotheos, Praxiteles, Leochares and Skopas, but their works are known mainly from Roman copies. Little architectural sculpture of the period remains intact. 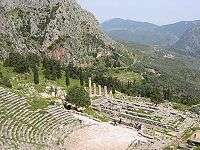 The Temple of Asclepius at Epidauros had sculpture by Timotheos working with the architect Theodotos. 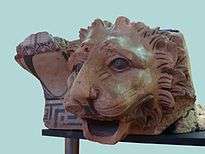 Fragments of the eastern pediment survive, showing the Sack of Troy. The scene appears to have filled the space with figures carefully arranged to fit the slope and shape available, as with earlier east pediment of the Temple of Zeus at Olympus. 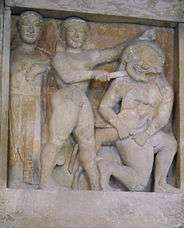 But the figures are more violent in action, the central space taken up, not with a commanding God, but with the dynamic figure of Neoptolemos as he seizes the aged king Priam and stabs him. The remaining fragments give the impression of a whole range of human emotions, fear, horror, cruelty and lust for conquest. The acroteria were sculptured by Timotheus, except for that at the centre of the east pediment which is the work of the architect. The palmate acroteria have been replaced here with small figures, the eastern pediment being surmounted by a winged Nike, poised against the wind. 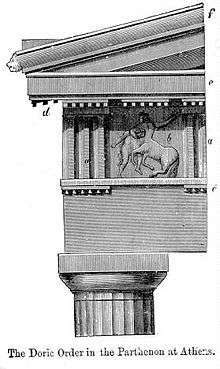 Hellenistic architectural sculpture (323 – 31 BC) was to become more flamboyant, both in the rendering of expression and motion, which is often emphasised by flowing draperies, the Nike Samothrace which decorated a monument in the shape of a ship being a well-known example. The Pergamon Altar (c. 180–160 BC) has a frieze (120 metres long by 2.3 metres high) of figures in very high relief. 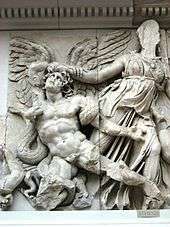 The frieze represents the battle for supremacy of Gods and Titans, and employs many dramatic devices: frenzy, pathos and triumph, to convey the sense of conflict.